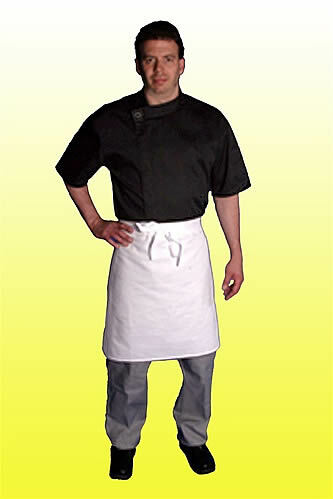 Chef Aprons & Kitchen Aprons ~ Short. High Quality kitchen aprons made in America. Aprons not only keep you can, but they can provide handy-dandy places to store things. (Yes, we said "handy-dandy".) This one features three front pockets. If you're a server, you know that these are essential for holding pens and pads firmly in place. This apron works equally well for cocktail and bar staff, and even the home cook. The fabric is a high performing poly cotton blend – Ultra Lite PC. The apron measures 13" long and is 24" wide. The fabric waist ties are 42" long, allowing you the ability to tie this in the front or the back. Read more about the aprons. 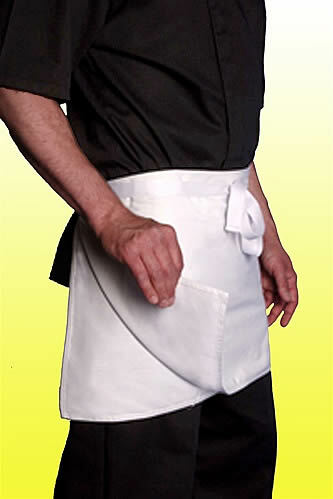 Nothing looks smarter than a clean and fresh looking white apron. This version is a nice short length, perfect for wait staff and the home cook. Easy to wear and easy to tie, this has nice long 42" ties. It is made out of a high quality poly cotton blend twill fabric. The front has three pockets. These are great for holding pens and pads if you're a server. For the home chef, imagine never loosing that recipe card again! Read more about the aprons. 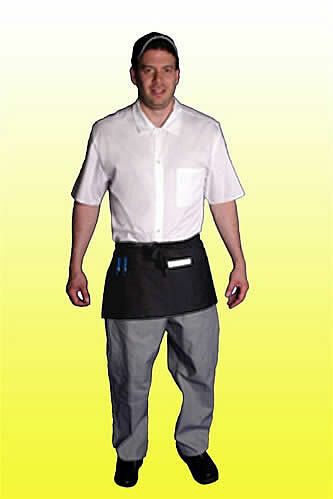 This short length 4-way apron is perfect for front or back of the house in restaurants. It's made from a durable and easy to care for fabric that's a 7 ounce poly cotton twill. The apron has two reversible panels. It measures 24" long by 30" wide. The waist ties are nice and long, at 42", and are grosgrain fabric. When you need to keep a fresh appearance, these aprons are perfect. Read more about the aprons. Sometimes you want an apron that's a little longer but not quite a full length apron. This mid length is great for covering your pants to about knee length. It measures 24" long and is a generous 30" wide. The waist ties are 42" long and done in a grosgrain fabric. 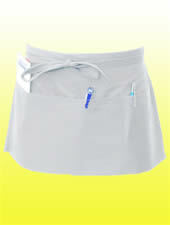 This comes in a clean bright white fabric that is ultra durable and easy care. It's made from the proprietary Ultra PC 3000 fabric which is amazing when it comes to stain removal and washing. Simply throw this in your washer and dryer – give it a quick shake out of the dryer and it looks terrific and ready to wear. Read more about the aprons. * Love these short aprons but live outside the US? Contact us, tell us where you live and what you want to buy and we'll send you an exact shipping quote. About the Ultra Lite PC Fabric: Ultra Lite PC is very similar to the Ultra PC 3000 fabric ~ it's just a lighter weight fabric. It's a 5 ounce fine line twill, with a tighter weave and a higher thread count. It's much smoother to the touch than the PC 3000. It breathes the same way and repels the dirt the same way. It has the same moisture wicking capacity, and requires the same care. No ironing – just put it in the washer and dryer, give it a good shake, and the clothes come out of the wash like you pressed them.